Jean Ritchie is credited with introducing the dulcimer to the world. In New York they were thrilled to share their version of the instrument as well. The west coast being a competitive rival soon followed suit and in spectacular form redesigned it yet again. Soon there are folks from all over the world making and playing this new wonderful instrument invented in the lowly back woods towns of the Appalachia. Or are they? The instrument went by many names 150 or so years ago, none of which was “dulcimer”. It wasn’t until much later when folks from the big city came to study the local folks of the region did they translate the term “dulcimer” from the several dialect pronunciations of the word “dulcimore”. Interestingly enough, the term “folk” to me congers up the way we make things our own. When we meet a new friend George from Guatemala we are somehow compelled to pronounce it by the American George, instead of “horehea”. And so they did change the word to dulcimer and that was just the beginning of all the changes. You see to fully understand the American Dulcimore you must have an appreciation for the “dulcimore”. When folks from the revival made the dulcimer their own, they left very little behind. Even in the classification of the instrument, the original was referred to as “pre revival”, as if it could not have been without the revival instrument. (Isn’t it funny how educated folks like to use pomp and circumstance.) The way it was played was left behind with the exception of a handful of individuals, and about as many to make the traditional dulcimore. The revival instrument is chorded like a guitar, and the noter was abandon as being backward and elementary. Full guitar frets are used to accommodate the chording. The strings are off the shelf guitar strings, bass being wound giving an illusion of sustain as does the dual coarse melody strings. The finish is lacquer which looks wonderful but makes it very susceptible to temperature and moisture changes, so much for the modern dulcimer. We are all likely to imagine our perception of the dulcimore (or dulcimer) is somehow more correct than the next guy. I am no different. The dulcimore is one of three designs from three different regions. First my favorite, the traditional hour glass and tear drop shape. The shape doesn’t make a different instrument. The elliptical can be included with these, but usually is classified with the Galax as it has a different string method and some with a false bottom, and then there is the Tennessee Music Box. All are tuned with either zither pins or wooden friction pegs as they have been for hundreds of years. They use music string from whatever source they can. Fret staples are hand made from broom wire, brass safety pins or fence staples. The wood selected is primarily poplar because of its easy workability and incredible sound, yet other species are used too. Most were not finished and some were highly embellished and the rest somewhere in between. I’ve been watching several you tube videos about tooth and scrub planes for quite a while now. Knocking the idea back and forth, the tooth plane seems so romantic somehow, but the scrub plane is the most suitable for the task of rough smoothing the panels I make. I was looking to buy a tooth plane iron for a number four I have two of and just smooth with the other. Then considered making a scrub from the Harbor Freight $10 Number 33? Then realized I really don’t need a tooth plane, and I have a spare iron for the number four so why not just grind it down to a scrub? So I did. After a few more videos from masters with highly specialized tools, I hand ground it down on my 5 inch bench grinder. 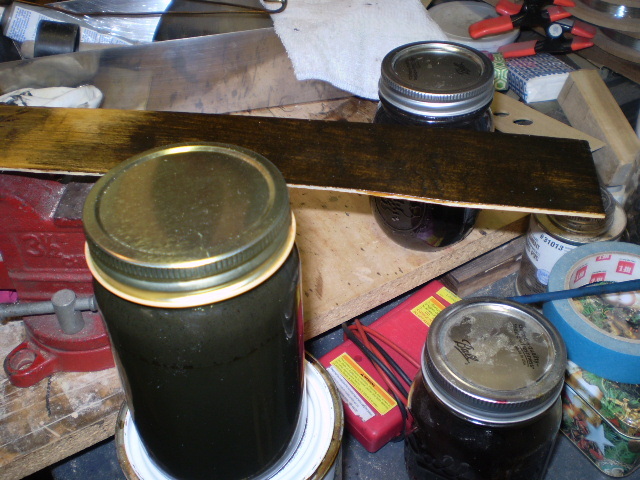 Then proceeded to finish it with my whetstones, and polish with my strop. In less than an hour I have a 3 inch radius on the iron that will shave the hair on my arm! 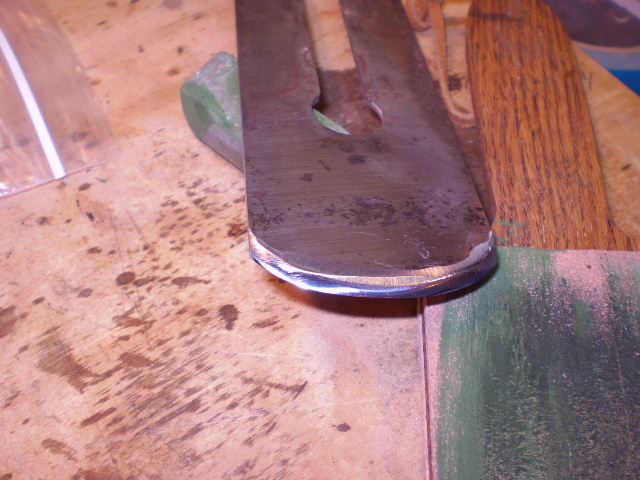 (Customary to individuals who sharpen tool irons and chisels) I still enjoy getting there.